Fentanyl crisis: Surrey social service providers are suffering trauma from witnessing multiple drug overdoses. Nov. 29, 2016 12:00 p.m.
Recounting how she saw three people brought back from the brink of death, it seems she is reliving the incidents. In fact, in the last 24 hours, she hasn’t stopped thinking about witnessing the overdoses, the victims’ loss of breath, the pending systemic shutdown, the seeming eons before help arrived and the eventual medical revival on the street. Sheri Moss fights back tears as she describes the three drug overdoses she saw in a single day last week. As painful as it is, talking about it is part of her own healing, an essential element in overcoming the trauma she endured by watching people nearly die after using fentanyl. 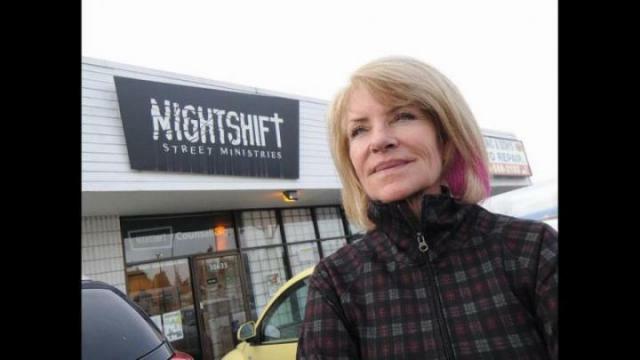 On the morning of Thursday (Nov. 24), a woman fell down in front of NightShift Street Ministries in Whalley and stopped breathing. The clock was ticking. Without assistance, she would be dead in four minutes. Moss deployed what she sees as two essential skills: She called 911 and prayed. The woman had overdosed on drugs, likely fentanyl – an extremely potent opiate that’s killing addicts at an unprecedented rate in the province. October saw the highest monthly death toll since April for drug overdoses in B.C., claiming 63 lives. The total deaths reported by the B.C. Coroners Service now stands at 622 for the year until the end of October, up markedly from the 397 deaths during the same 10 months of 2015. Fentanyl, a powerful synthetic opioid, continues to be linked to approximately 60 per cent of drug-related fatalities this year. B.C. Emergency Health Services said over the last week, the province had the highest number of overdose-related 911 calls ever recorded. There were 494 suspected overdoses between Nov. 17 and 23. Of those, 271 occurred in Vancouver’s Downtown Eastside and 81 in Surrey. Susan Kotlowski (left, with husband Greg), an outreach worker at Surrey’s NightShift Street Ministries, said she was waiting on hold with 911 for three minutes on Thursday while an addict lay prone outside the group’s office at 10635 King George Blvd. Several people on the street attempted CPR and mouth-to-mouth resuscitation. The girl was turning blue and her lips were going black. MaryAnne Connor, founder and president of NightShift, a group that feeds and cares for the homeless, was sure the girl was going to die. The team leaders at NightShift held a meeting that evening to discuss the two overdoses they saw that day and how it affected them. The drug naloxone (brand name Narcan) temporarily blocks the effects of heroin and fentanyl, essentially bringing people who have overdosed back from the dead. Inside the NightShift meeting room there was shock that this street crisis was unfolding for a third time in one day. “I can’t do this again, someone else has to call, I’m still shaking from last time,” NightShift’s Moss said at the time. In minutes, Narcan was administered and the addict was revived. It was the last of a series of sights that won’t leave the team at NightShift anytime soon. “I go home, it’s midnight, and I’m brushing my teeth, and all of a sudden I burst into tears. I just couldn’t stop,” Connor said. Staff and volunteers at NightShift were to be treated for “vicarious trauma” they experienced from what they saw. And they aren’t alone in dealing with the traumatic fallout from the crisis. Ambulance paramedics are also feeling the emotional lash of attending to a tsunami of overdoses. Dave Leary is a paramedic in the Surrey/North Delta area, and says the emotional effect of this crisis on him and his colleagues is palpable. “It sticks on multiple levels,” Leary said. He’s now seeing the same addict more than once in a day. In one instance, they brought someone to hospital, he was released, and Leary treated him for another OD that afternoon. He said he and his fellow paramedics have never been so busy. In a four-day block of shifts, he used to see one overdose. “We’re getting now where we’re seeing multiple in a day,” Leary said. Crews are trying to keep the emotional impacts at bay by talking with each other about it wherever possible and accessing a critical incident stress program when needed. The province has faced tremendous pressure to address the fentanyl crisis. As a result, on Nov. 25, the provincial health ministry announced a $5-million injection of funding for paramedic services, which will fund stationary medical support units in the Downtown Eastside of Vancouver and high overdose areas of Surrey. The stations will act as a re-supply area for paramedics and will furnish users with information about how to stay safe. Paramedics will also use bikes or ATVs to respond more quickly in hard-to-navigate areas. Speaking on behalf of his union, Leary said the added resources are welcome, but far more is needed. He said it’s estimated there are another 25 ambulances required in this region, even without a fentanyl crisis. In the meantime, Connor just hopes her crew can hold it together long enough to continue bringing needed help to Whalley’s most vulnerable.